Lauren has worked within the Beauty, Spa and Aesthetic industry for over 12 years and she is passionate about skin health. During this time Lauren has gained a wealth of experience within award-winning Day and Hotel Spas, Independent Clinics and National Clinic Chains. She was later promoted to managerial level, including Head Aesthetican and Academy Manager roles. During her time in Aesthetic Clinic’s, Lauren took it upon herself to complete her Level 4 qualifications as she wanted to feel more confident with treating skin conditions and concerns and to give her clients the best results and service. Whilst at University, she worked within a private training organisation as Academy Manager and enjoyed helping Students reach their potential, sometimes with a complete career change. 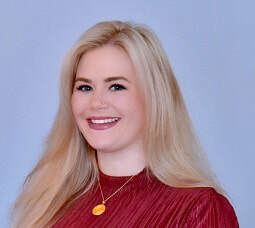 Lauren received a First-Class Honours degree in Business in 2018, accredited by the University of Birmingham. During her time at University, she nurtured her skills in Marketing and graduated within the top percentage of her class. As Marketing Manager, Lauren is responsible for all things digital and our promotional activity. As Course Tutor, Lauren is here to guide and mentor our Level 4 Students, to help them reach their potential. Lauren enjoys seeing students careers flourish from the training at Sally Durant Aesthetic Education and Training; she is excited to be part of team SD! "We love hearing from our students who have successfully completed their studies and are working confidently in the world of the aesthetics"
Lauren sponsors a Guide dog Stud dog & is passionate about this organisation, in her spare time you will most likely find her in the countryside with her pooch!